Is the Myth of Isis and Osiris, Horus and Set Relevant in Today's World? This is the question an Egyptian friend of mine recently asked, and I thought it was a good question. I don't think any myth ever stops being relevant, and this particular myth is alive and kicking. Consider the Middle East, and in this particular case, Egypt. The healing that comes in that great story comes through gaining the clarity of vision through the Eye of Horus. Horus, the younger generation of heroes, is always battling chaos, trying to return his kingdom to the bounty that existed during the time of his father, Osiris. There are, of course, a couple of layers with this myth. Set and Horus battle for years, years!!! eons. Set feels that he never received his fair share of th divine promise, that Osiris had it all handed to him. Then he killed Osiris to claim himself as heir to the throne, even attempting to prevent Horus from being born. But the gods and goddesses watch over this divine but all too human drama. Horus grows up and wants his birthright. 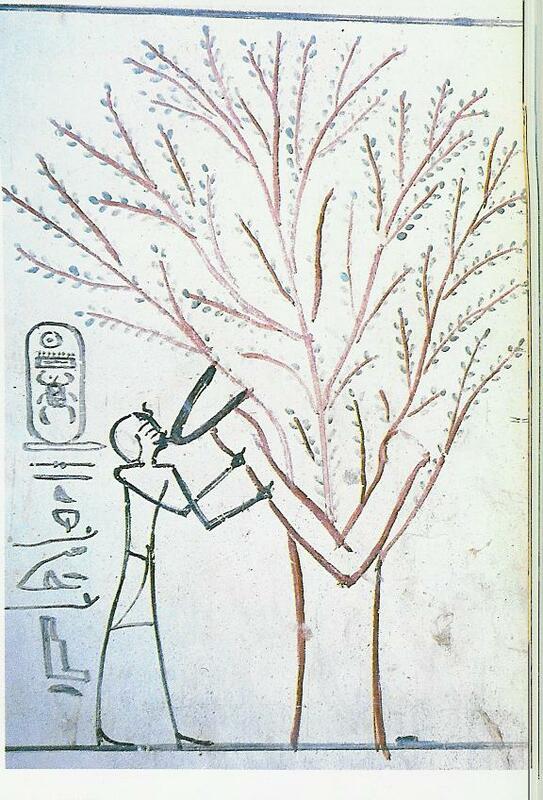 depicted here as the sacred sycamore. The battle is ongoing, each trying to murder the other, until the goddesses Isis and Hathor intervene because they are the embodiments of human and spiritual love. When Set overpowers and blinds Horus, his beloved Hathor heals his blinded eye with the milk of her breast. While Horus is being trained to be a spiritual warrior, he meets his father Osiris, Lord of Duat, in the dreamtime. Osiris teaches him through the subconcious, through the principles of what we might consider dream, synchronicity, and the imagination or psychic realm. And remember here the point is not missed that the dream world contains our shadows, which really is what we must battle—that is the dark aspect or ourselves, the disavowed. Oh, I’m the good guy, one might protest. Right. And so is the other. Neither side must demonize the other. The myth also tells us In the midst of the battle the myth tell us that Isis tried to intervene and stay the hand of Horus when he was in control, because, or course, neither side can be 'supreme' they must work in conjunction with each other through love. But Horus didn't like that idea so he cut off his mother's head. I think we can see that happening today. Set imprisons Isis to prevent her from birthing and nurturing Horus. Horus angry with his mother cuts off her head. How's the feminine principle doing in that battle? She is getting lost and beat up fairly badly. But Thoth, god of wisdom replaces her head with that of Hathor, that beautiful goddess of human and divine love. That is the principle LOVE that balances the battle between left and right. Do you think it is applicable today in what is going on in the world? Well, yes, I think so. I see that battle between Horus and Set as what is happening in Egypt today. And I see that when both sides try to imprison or cut off the feminine voice, the battle will do nothing but continue to rage. Love must prevail, and cosmic order. Isis and Ma'at. Of course, that is just my take on it. You can decide for yourself who is Horus, who is Set, and who is Osiris. And I will say, that in Jungian terms, we all have within us a feminine archetype that operates on the principle of love. Call upon her. Go forth and enact a great love. The sign of Aquarius is the image of two waves of water moving in unison. In ancient Egypt this was called the male and female water, the Nu and Nu-t. 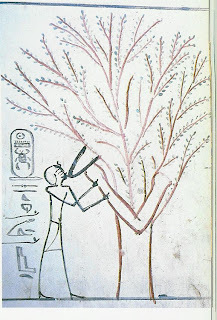 The male Nu was the river Nile flowing across the land; the female Nuit was the body of the Milky Way flowing in a simultaneous stream above the river. Ancient Egyptian zodiacs depicted the god Hapi as pouring forth the waters from two jars. An image that is repeated in the Greek astrological sign. The dual streams poured forth from two jars is an image also repeated in the Star card of the Tarot. The unveiled Isis, which is the Star goddess pours one stream onto earth (the plane of form) and the other into the pool of cosmic mind. Isis appears prominently as Sirus twice a year--once in summer at her heliacal rising, which annually signaled the Egyptian New Year and the imminent Nile flood. And at midwinter when high overhead Sirius is the brightest star in the sky, signaling the birth of the divine child through Isis. Tonight look for her – a diamond-like star that flashes with green, blue, pink, and white starlight. And if you continue lifting your gaze upwards, you will see the constellation of Orion, which the Egyptians associated with Osiris, the Beloved of Isis. In esoteric circles the sign of Aquarius is the cosmic Christ that appears after the personal sacrifice that the Christ of the Piscean age represented to lead his initiates into true humanitarian Love Wisdom in this age. This water of both male and female vessel that is the energy of this particular Aquarius Full Moon has important significance, as it follows the December 21, 2012 shift into the intergalactic center of the Milky Way. Here, as we enter into the new age, we celebrate this full moon in Aquarius as the sign of movement from personal consciousness and its desires to the group consciousness that promotes the love of all humanity. It is eternal spiritual renewal—our consciousness merged with divine consciousness. The Aquarian energy is living water that flows from the throne of heaven. It is intended to slack the thirst of many through the communal well--the acts of sharing, loving, and giving. The Christed One has said: “Wherever two or more are gathered in my name, there am I also.” We take this to mean that the cosmic consciousness is strengthened by work in groups of like-minded initiates. Whereas Pisces has been seen as the sacrifice of the one for many individual souls, the Aquarian energy must be the commitment and willing sacrifice of the many (group commitment) for the greater good of the planet and each other. By using this full moon energy you can see the opportunities to see how to make your next steps, to attain enlightenment, to understand brother and sisterhood. We are being presented with a greater awareness and a time to explore of our place in the cosmos, greater fields of human endeavor, greater contact with spirituality sensitive people and with groups for spiritual advancement, right timing and use of right energies, cooperation with Hierarchy, and contact with the Christ/Buddha consciousness in meditations and instructions. The Creative Work of true alchemy -- a process of manifesting the inner Divinity through beauty, goodness and truth. That seed of potential exists in every one of us. 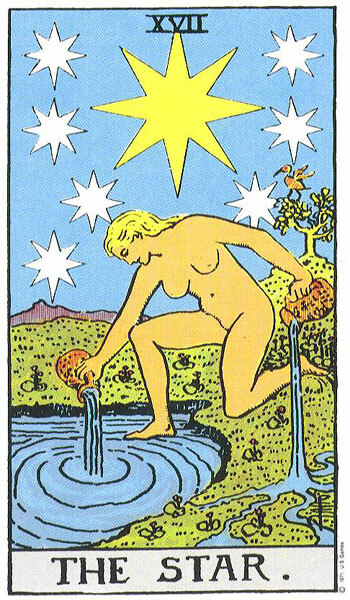 You may imagine it as being watered by the water of life of Aquarius, poured out by Hapi, by Isis, by the Christ. Like Merton’s vision, the third thing we are given a chance to experience is that Brother and sisterhood as a state of consciousness in which there is no judgment, no separateness, envy, anger, hatred for you see all is unity. True freedom from the veil of glamour or illusion is recognizing that people really do love you, that they will encourage you toward success. You are protected because there is only one Light, one Truth and one Reality. We are being directed now to see the power of working with Group Consciousness in groups of like-minded people who are working toward the betterment of themselves, their society, and the planet, with regard for all sentient creatures. Group consciousness is the greatest lesson we can learn. Form follows thought and so when that thought is strengthened by multiplication and purified through ritual it has the potential to do the greatest good, especially when the little will is laid down in order to serve the Greater Good through Divine Will. We may find that now in this new era spiritual practices will move away from dwelling on a dying god whose sacrifice saves individual souls to the consciousness of group engaged in ritual and ceremony that elevates all. We become less individually mystical and more dynamically magical. We move away from the either/or world of material reality vs. spiritual reality, to the more potent realm of matter AND spirit at work simultaneously. Even if you are working alone at this time of Aquarius, you are not truly alone, because you may call upon the group consciousness of the Angelic realm, the archangels and the host of spiritualized beings and ancestors. You may find yourself being taken out of body at night to an inner school and taught by a wisdom teacher alongside other initiates. Know that as a disciple you are being asked at this time to work on both sides of the veil and that you are helping with other evolutions and the expansion of alternate realities. A lot of astral energy is available to you now. The more we make ourselves available to work through this less egoic astral energy (because the ego drops away from the conscious mind during sleep), the more peace we find on the planet. You may even find your memory of your dream time work more clear. This time of shifting energy into a new age will be accompanied by trials and will not be easy. We are already experiencing trials of fire, solar flares, melting ice caps, solar heat, shifting tectonic plates, hurricanes, war, earthquakes, greed, disunity, civil mayhem.. All of the things we are experiencing we will continue to see for years to come as the shift takes place. These are not signs of an apocalypse, but a sign of deep transformation needed to the core of our consciousness. We are responsible for overseeing how our life is transmuting and into what forms. It is up to the group to accomplish deep transformation of energies through Love Wisdom, through Creative Vision, through Cooperation. At this full moon, the first of 2013, plan how you will execute these tasks through the coming year. How will you be a light-bearer in a darkened world?